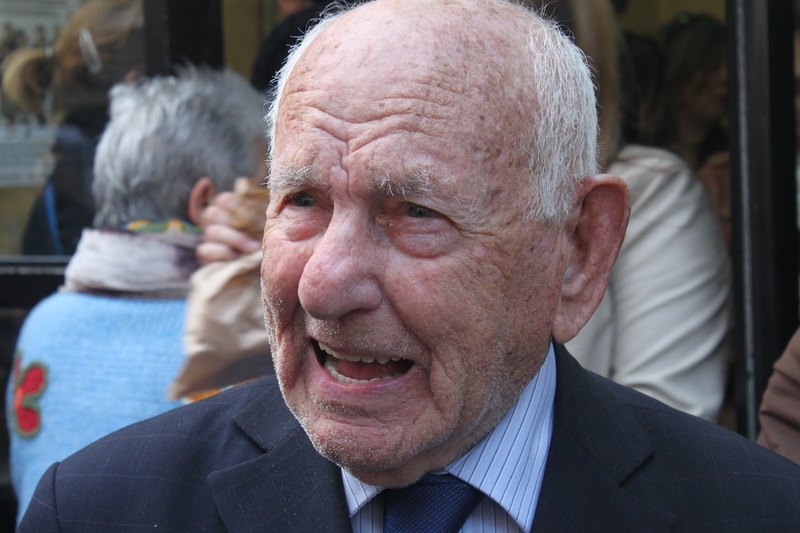 Max Levitas was a towering figure of Britain’s labor movement. A hardened enemy of the Blackshirts in the years before World War II, the Irish-Jewish communist devoted nearly a century to fighting injustice. With the death of Max Levitas, who passed away on Friday, November 2 at the age of 103, Britain has lost one of its most beloved Communist figures. An adopted son of London, and the East End particularly, Max was a towering figure in his local community, widely respected for his staunch advocacy of working people against racism and oppression. With his passing, the broader labor movement has also lost one of its last remaining links to the heroic struggles against fascism, mass unemployment, and treacherous living conditions waged by millions of ordinary people in the 1930s. Max was a prominent working-class militant who played a central role in many of London’s great labor upheavals over the course of many decades. Even after his sad passing, his lifelong commitment to the cause of labor is an outstanding example for future generations. Harry Levitas and Leah Rick both belonged to the generation of young Jews who fled westwards from the antisemitic pogroms and endemic poverty of the Tsarist Empire. Having left their respective homelands of Lithuania and Latvia, they met in Dublin in 1913. There, they married and settled into the tight-knit Jewish community based around the Irish capital’s Portobello neighborhood. Max was born in 1915 in the same “Little Jerusalem” area that James Joyce chose as the home of Leopold Bloom in Ulysses. Max’s first years were marked by Ireland’s fight for freedom. As a baby he survived the Easter Rising of 1916, which was centrally organized by the socialist republican James Connolly, a one-time local council candidate who had printed election leaflets in Yiddish. Max later recalled how during the War of Independence his mother attempted to shield him and his siblings from the bullets sprayed into houses by the Black and Tans (British auxiliary units) by putting cushions on the windows. His father Harry, who had been a comrade of Connolly’s, was a tailor by trade, and his activity in the International Pressers and Machinists Union (known locally as the “Jewish Union”) brought him into perpetual war with Dublin’s sweatshop bosses. Once Harry had been blacklisted by practically all of the Irish capital’s garment employers, the Levitas family moved to Glasgow, and then on to Stepney in the heart of London’s East End. Having gone to a nearby café to wash incriminating paint stains from their hands, the two returned to the scene to inspect their handiwork, but were immediately detained by policemen who spotted white paint on their shoes. Though Max claimed he “took no part” in the sloganeering, he was fined £10 — nearly £700 in today’s figures. However, he was happy that the case was printed in the Thursday, September 7 edition of the Times, since the only point of the action was to publicize opposition to a large British Union of Fascists (BUF) rally that coming Saturday in Hyde Park. His spirit of purpose reflected an increasing desperation in the socialist movement of this period. From Berlin to Vienna and Paris, the international situation was bleak for the Left, and Communists in Britain were determined to take to the offensive. In June 1934, Communists disrupting a BUF meeting in Olympia, London were brutally beaten by fascist stewards, prompting even Conservative MPs like Geoffrey Lloyd to express their revulsion at the display of fascist violence. Having learned the lessons of Olympia, the Communist movement then delivered a victory for antifascism at Hyde Park. To quote a Daily Worker headline, the more than one hundred thousand antifascists were successful in “drowning the Blackshirts in a sea of working class activity.” This event dampened the enthusiasm of Oswald Mosley’s men, who became increasingly wary of holding rallies in working-class cities. Ragotski, Schaffer, Max Levitas, Fenebloom, Hyam Aarons, Sapasnick . . . Old English names: thirty-two of them out of sixty-four convicted since last June for attacks on Fascists. Thirty-two names of that character. [A] spontaneous rising of the British people against fascism? The racist tone of Mosley’s speech reflected a strategic turn for the BUF, who began to recognize the gains they could make in pushing anti-Jewish politics. As an organization, the BUF had enjoyed a membership of fifty thousand in July 1934, but had dropped to a tenth of that number by the end of 1935. Organizing in “Christian” neighborhoods of East London such as Bethnal Green, Shoreditch, and Hoxton, the fascists rebuilt themselves through the creation of anti-Jewish campaigns that fed off already-active hostility towards Jewish people. By March 1936, the BUF had recovered to approximately ten thousand in number, focusing its appeal more and more towards people interested in political violence, attacking Jewish people, and disrupting “red” meetings. On the morning of the fourth, several thousand fascists assembled in Royal Mint Street, awaiting their leader. Half a mile away, countless East Enders jammed the area around Gardiner’s Corner. Police attempts to knock back the crowds to make room for the Blackshirts were fruitless, and the throng fought back. The situation quickly escalated, with workers ripping up cobbles from the streets; a Communist tram driver even abandoned his vehicle so it could be used as a barricade. When an antifascist infiltrator into the Blackshirts tipped off Communist organizer Phil Piratin that Mosley was heading down Cable Street, he dispatched loudspeaker vans to tell people to head to the barricades that had already been built there. When it became clear that the police were in no position to fight the armed masses standing behind the barricades along Cable Street, the Blackshirts were escorted three miles away to Embankment and ordered to disperse. The march was abandoned. When we heard that the march was disbanded, there was a hue and cry amongst the people at Gardiner’s Corner. The flags were going up wildly — the red flags and others . . . people shouting “We have won!” The only slogan I can remember to this day — was “No Pasarán” [“They shall not pass”]. That was the slogan that we shouted — it was a slogan of victory. Following the events at Cable Street, Mosley’s movement began to recede, though many antifascists — such as Max’s brother, Maurice — saw the events as a wake-up call, and volunteered for the International Brigades to defend the Spanish Republic against Franco, Hitler, and Mussolini. Max, however, had thrown himself into organizing the burgeoning tenement movement in East London. In the mid-1930s, acts of protest by tenants refusing to pay rent became a sporadic occurrence in the squalid tenements of Stepney, and local Communists saw the potential in uniting the informal networks that were created in these struggles. In autumn 1937, the Stepney Tenant’s Defence League was founded in a room in the Paragon Mansions tenement block, and immediately began directing efforts to create mass collective resistance to slum landlordism. Soon, the League had 7,500 members and had spread a rash of rent strikes across Stepney’s slum dwellings. The two buildings were effectively in a state of siege. On their way to and from school, children were hoisted up and down to their flats by their parents on ropes, and even milkmen had to secure league “permits” before they could deliver at the buildings. By June, the authorities were exasperated, and ordered a raid. Nearly a hundred police officers smashed through the barricades and fought the tenants, who had armed themselves with saucepans and shovels. This provocation brought the rent strike national attention and worked against the landlords: Labour members of parliament began asking questions in parliament about what plans the government had to improve the foul living conditions in Stepney, and a YCL rally of fifteen thousand people in defense of the tenants ended in pitched battles with the police. The pressure was too much: both landlords negotiated a deal with tenants that was clearly a decisive victory for Max and his neighbors. With the help of sympathetic waiters, scores of protesters occupied the luxury hotel’s air raid shelter, with the group releasing a statement that “if it was good enough for the rich, it was good enough for Stepney workers and their families.” The news reports of the event triggered a spate of similar incidents — crowds of people surged past police lines and used crowbars to break into Underground stations during the German bombing raids. By the end of September 1940, the government had conceded, and it was estimated that seventy-nine Underground stations were serving as shelters for approximately 177,000 people. In 1945, Max was among the ten Communists who caused a sensation when they were elected as councilors in Stepney. He was voted into office thanks to his proven track record fighting injustice. The Communist organizer and “Red Commander” of Cable Street, Phil Piratin, was also elected to parliament on a Communist ticket, cementing Stepney as a radical bastion. Even during the Cold War, many Communist councilors in Stepney continued to be reelected out of the local community’s gratitude for their personal dedication to the area and its residents; Max himself continued serving on the council until the sixties. We wanted to ensure that the ordinary working people of England could lead decent lives — not to be unemployed, that people weren’t thrown out of their homes when they couldn’t pay their rent, that people weren’t homeless, as so many are today, living with their parents and crowded together in rooms. Over a century since it began, Max Levitas’s long struggle is over. The system he fought against limps on — but the fight against that system, in this country at least, is stronger than ever. Marcus Barnett is the international officer of Young Labour and the associate editor of Tribune .